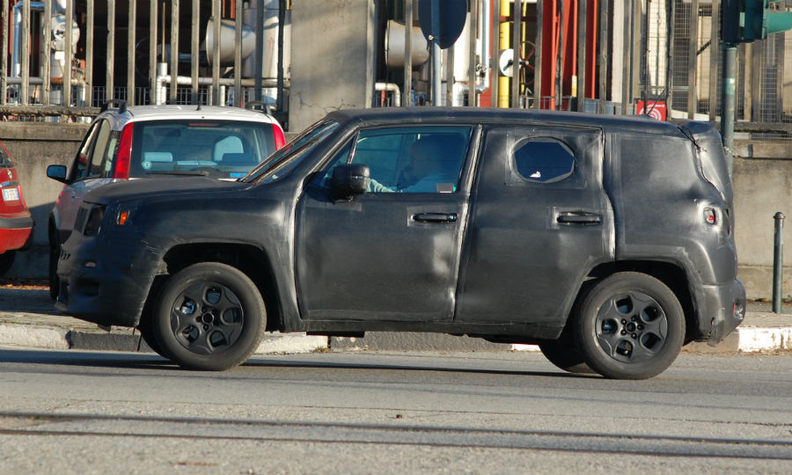 The camouflaged “baby” Jeep prototype shows a vehicle with similar styling to the Jeep Wrangler. It has a boxy body, almost vertical windshield and pronounced angular wheel arches. 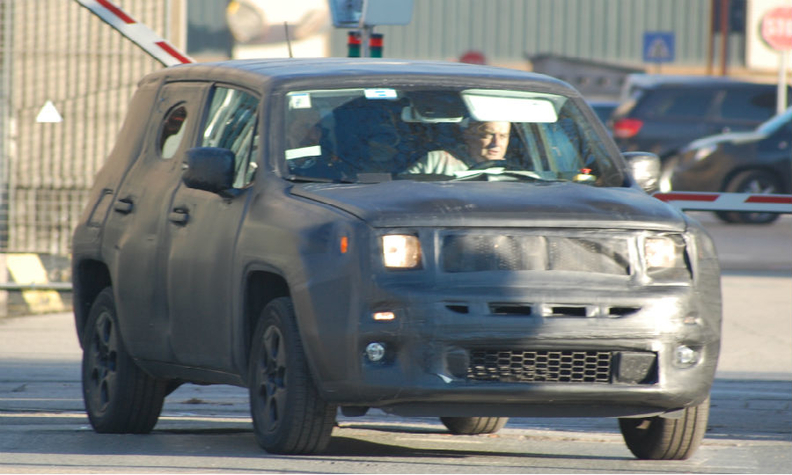 TURIN -- The first heavily disguised prototype of Jeep's upcoming subcompact SUV was spotted undergoing road tests here last week. The still unnamed model will be the brand's first vehicle built only outside of the United States. The "baby" Jeep will be produced at Fiat's plant in Melfi, central Italy, alongside Fiat brand's sibling model, the 500X. The Jeep will debut at the Geneva auto show in March and will go on sale in Europe in the summer and in the United States late this year. The 500X will be unveiled at the Paris show in October and will go on sale by the end of the year in Europe and in spring 2015 in the United States. Fiat and Jeep plan annual production of up to 280,000 units of the two models. The planned annual volume for the Jeep is up to 150,000 units, while Fiat's version will account for 130,000 units, two supplier sources involved in the project told Automotive New Europe. The "baby" Jeep's success is key to helping the brand to reach its target of 1 million annual vehicle sales this year, up from a record 731,565 last year. Fiat-Chrysler CEO Sergio Marchionne said in a call with analysts on Wednesday that the model will not be called Jeepster, as some reports have said, but he did not disclose the model's name. The Jeep could be call the Laredo, two industry sources told Automotive News Europe. The Laredo is an iconic name for Jeep and was used for entry trim levels of Jeep models. Jeep's new SUV may be called the Laredo. Mike Manley, head of the Jeep brand, said the subcompact SUV would lure customers in the United States and other markets away from sedans and hatchbacks. He said that he has set "very aggressive" sales goals for the vehicle as a result. "If we get the right ride and handling and we get the right fuel economy -- and I'm convinced we will -- not only will we be competitive in what is the emerging B-SUV segment, you're going to see hatchback and sedan buyers in B and C [segments] looking at that vehicle as a competitive alternative," Manley said in an interview at the Detroit auto show earlier this month. Some industry watchers are skeptical about Jeep's sales targets. Jeff Schuster, senior vice president of forecasting at LMC Automotive, said that Jeep might hit 1 million annual vehicle sales by 2020, but not this year. "All the planets would have to perfectly align, even those we don't yet know about, to hit the target in 2014, so we just don't see that happening," he told Reuters. Italian journalists who recently saw a pre-production Jeep subcompact said that, in addition to Jeep-like exterior styling, the model has an interior with a high quality fit and finish more common in premium vehicles. At about 4250mm long (167 inches), the Jeep will be sold only with four-wheel drive, including a trail-rated version and will offer a range of gasoline and diesel engines. The Fiat 500X will be the same size and will have the same powertrain options as the baby Jeep. In addition to 4wd, it will have a cheaper, more fuel efficient front-wheel-drive only variant. Fiat will release the first pictures of the 500X on July 4, the 57th anniversary of the original 500 launch. The 500X will replace Fiat's slow-selling Sedici, which Suzuki builds for Fiat at its plant in Hungary. Last year, Sedici sales in Europe declined by a third to 5,809 units, according to data from JATO Dynamics market researchers. The "baby" Jeep and the 500X are underpinned by Fiat-Chrysler's Small Wide architecture that debuted in 2012 on the 500L small minivan. The Small Wide is Fiat's first architecture developed from its conception conceived to comply with U.S. safety standards, in addition to European regulations.